Influenza (the flu) is a contagious disease caused by a virus. It is spread by coughing, sneezing, or respiratory secretions. A yearly flu vaccination is the best way to reduce your chances of getting the seasonal flu and lessen the chance you will spread the flu to others. We strongly encourage you to get your flu vaccine, which is available at Health & Wellness. You can also prevent the spread of the flu by taking care of yourself when you are sick. Read this message about flu prevention for UNH students, faculty, and staff. The flu vaccine is offered at no cost for students who have paid the mandatory health fee. Please bring your student ID. Make an appointment online or call 603-862-2856. Please allow a 20-minute wait time after receiving the vaccine. The claim for the cost of the vaccination will be submitted directly to your insurance provider. For employees who are not covered by the USNH policy, please check with your insurance company prior to your visit to ensure that they will cover the cost if you receive your vaccination at Health & Wellness. A flu clinic is offered for UNH students every fall semester, generally in October. Follow @unhhealth on social media or visit our Events page for updates. Cover your mouth and nose with a tissue, your elbow or shoulder when coughing or sneezing. Dispose of your tissues properly. Germs are often spread when a person touches something that is contaminated and then touches his or her eyes, nose, or mouth. Don’t share towels, eating utensils, toothbrushes, drinking glasses, or other items that may spread germs. 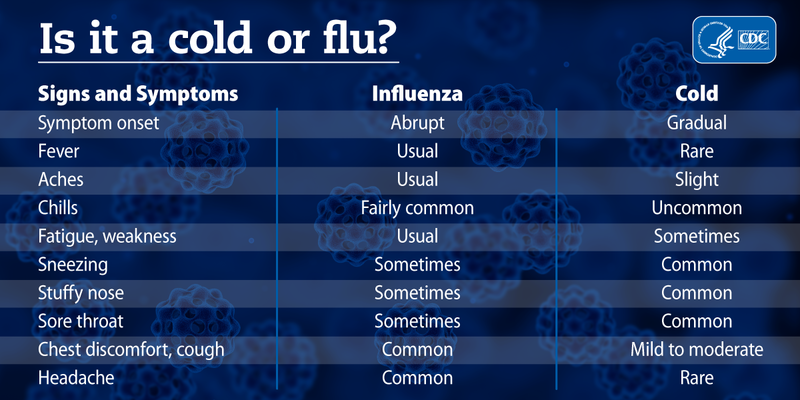 Even if someone is not sick at the time of sharing, he or she may still be contagious for flu or cold that can develop into symptoms the next day. As much as possible, avoid close contact with people who are sick. You can pick up germs/viruses through shaking hands, touching doorknobs, phones, computers, etc. Washing your hands often will help protect you from germs/viruses. Wash all surfaces of your hands thoroughly (fingers, between fingers, palms, back of hands and wrists) with soap and water. View, download, and print our handwashing poster. If you already have the flu, we want to encourage you to stay home until you are feeling better. Remain home until 24 hours after your fever is gone (without the use of fever-reducing medications). If you are unable to stay home, please remain in your place of residence (residence hall room, apartment, etc.). You should not go to classes, work, dining halls or participate in social activities. Avoid close contact with others. Contact your faculty to let them know you are ill. Health & Wellness does not provide doctor’s notes to verify illness or to confirm that students can return to class. Get plenty of sleep and rest. When you're awake drink one 8 oz. of clear fluids (water, broth, sports drinks) each hour. Eat well and ask your friends, family or RA to help you get meals so you that you can rest. If you have a sore throat, gargle with 1/2 tsp. salt in 4 oz. warm water and increase humidity with a vaporizer/humidifier. Consider taking acetaminophen, or ibuprofen. These medications will help to lower a fever and reduce headaches and body aches. Adolescents should avoid aspirin when they have the flu because it can cause Reye’s syndrome, a rare but serious illness. If you have a cough, consider taking medication with an expectorant and cough suppressant. You can also use cough drops or throat lozenges for symptom relief. Remember, the flu is a virus and cannot be treated with antibiotics. Also, antiviral medication is usually not recommended. If you have a chronic health condition and are experiencing influenza-like illness, or if symptoms worsen, please call (603) 862-2856. If you are not feeling well when Health & Wellness is closed, please call (603) 862-WELL (9355) and press 2. You will be automatically connected to a medical call center, where staff will conduct a phone assessment, and make suggestions for additional care options, including a possible visit to an urgent care center or hospital. Pneumococcal vaccine: Recommended for certain high-risk groups. Available at Health & Wellness.